A rare chance to hear Thomas Tallis’ soaring, uplifting, truly monumental Spem in alium as just one of five 40-part pieces in this concert at the Assembly Hall Theatre in Tunbridge Wells. It’s the iconic model for two pieces written for Ex Cathedra by Gabriel Jackson and Alec Roth. Roth’s breathtaking Earthrise is inspired by the famous photograph of the same name, taken 50 years ago by the Apollo 8 crew. 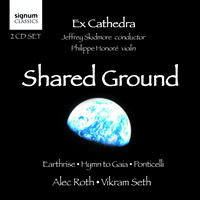 Listen to excerpts and buy the CD of Earthrise here. Part of Season for Change. Book via the link above or call the Assembly Halls Theatre box office on 01892 530 613.